It’s not every day when a big responsibility becomes exciting news. We didn’t know what we were in for, but we were ready to take on the task of being parents. I bet you’re expecting me to say that I’m pregnant. Ha. Well, I’m not! 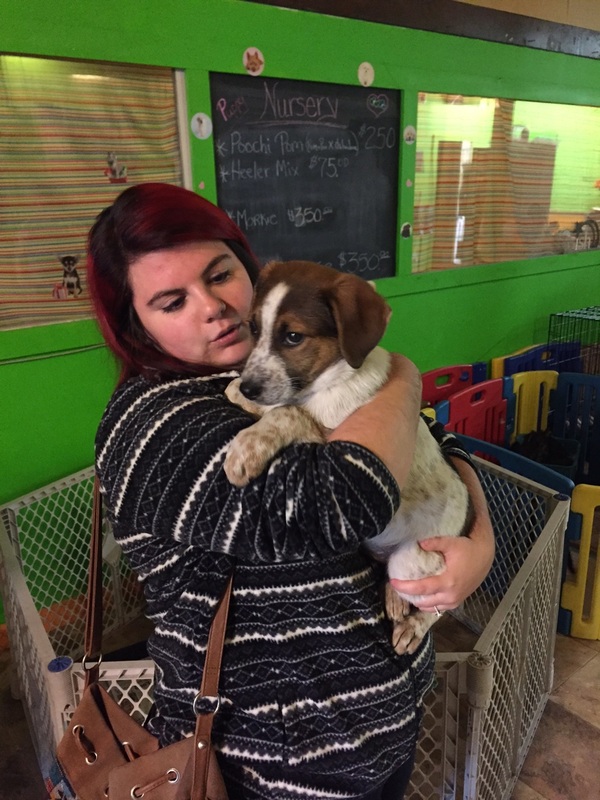 As of December 26, 2015, my fiancé, Brian, and I rescued a puppy. It’s always been a dream of ours to have a puppy of our own. We thought the chance was going to come closer to Valentines Day, but since a huge opportunity came along, we took it. We decided that we would split the cost of the pup and that would be our gift to each other. Two weeks before Christmas, I was searching on the Internet to see if anyone was giving away puppies that couldn’t take care of them. Don’t get me wrong, we were looking at adopting at shelters as well, but unfortunately, it’s a long process and we weren’t sure what was going to happen. So because of this, we were looking at all our options. That’s when I just so happened to come across an ad online about three puppies for sale to good homes. I clicked on the link, thinking that it was just another dead end, like all the others, but there they were. Only one was adopted so far, and the post was recent. There was a phone number coming out from the Ohio area so I decided to text the number and see if anyone would answer. Not long after I got a response. Sure enough, the woman on the other end had two puppies left, one female and one male. Since someone was going to look at the female that very day, I quickly asked her if we could go out and see the male in person and she agreed. So there we were, driving two hours to Carrollton, Ohio to see a 10-week-old puppy. We were nervous but excited. Since we couldn’t see too much of him in the picture, we didn't know what to expect, but we had hope. We drove all through the countryside, which was beautiful and calming. We then reached the small quiet town of Carrollton and parked near Pampered Pet Salon, where the puppy was. When we walked in we immediately saw him in his playpen. He was crouched in the farthest corner from us, scared, but not shaking. He just watched us as we calmly talked to him. When we met Harley, the woman I was exchanging texts with, she informed us about him and his background. He was a Red Heeler mix, about 9-10 weeks old. 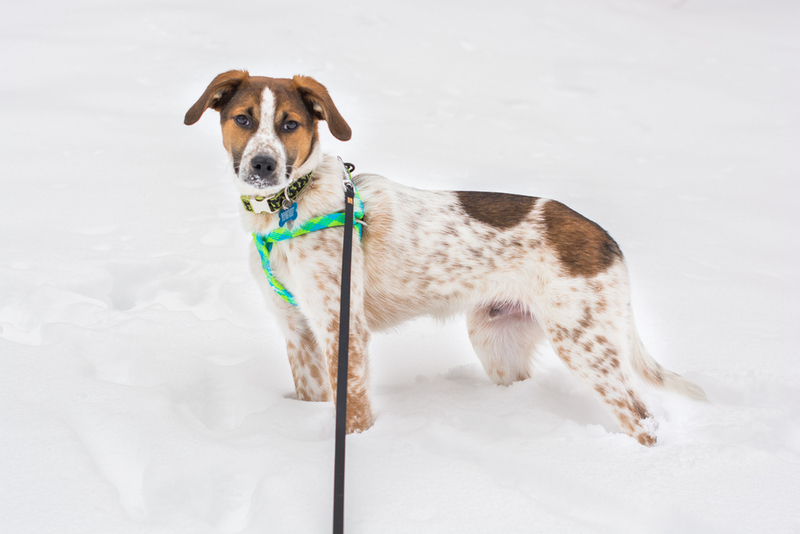 She wasn't sure what he was mixed with, but by his looks we had guessed Beagle or Brittany Spaniel. He came from a farm where the farmer’s dog had puppies and was unable to take care of them. She told us that he was very shy, but friendly. Since his two siblings had recently been adopted, he was lonely, even though there were other puppies there as well. She said he would follow them around, but keep his distance. He was scared on a leash; he had never been outside. After hearing that, we knew we would have our work cut out for us, but when she let us hold him, we just knew he was the one. He gave us each a kiss and stopped shaking when we held and talked to him. He was so soft and still had that puppy smell. We immediately told her we wanted him, agreed we could pick him up after Christmas since we were moving to our house then, and gave her money for food. We said goodbye to him and got back into our car, driving home and talking about names for him. Since we were seeing both of our parents before getting him, we decided to make it a surprise to tell them. To break the news, I found a sign online that said, “Our family has expanded by four feet.” It had paw prints on it, which gave the surprise away, so using Photoshop I deleted the paw prints (perks of being a photographer!) and at the bottom I added, “As of December 26, 2015,” so they wouldn't assume that I was pregnant. Brian’s family arrived first since they were helping us move. So on Christmas morning after opening gifts we told them we had one more gift for them. I handed the sign to his mom and she read it out loud. It took them a couple of seconds, but they finally guessed a puppy. We then showed her some pictures I printed out of him when we first visited him. They all thought he was really cute and said they couldn’t wait to meet him. When my mom came over later to see us, we did the same thing with her. We gave her some small gifts and then I told her we had one more. It took her a little too, but she guessed it and was so excited! Again, like Brian's parents, we showed her the pictures and she thought he was adorable. Since we were also visiting my mom for New Years, she was very excited because she would get to meet him first. We then announced that the name we had chosen would be, Rusty. Both for our love of rustic things and his coloring. It just fit. On December 26, 2015, our journey began. We drove the two hours again to Carrollton, Ohio to pick him up. When we arrived Rusty actually seemed to grow a little bit, but we didn’t mind. We couldn’t take him out on the leash because he was too scared, so we had to carry him out to the car. Once in the car, he laid down on my lap and just stayed calm the whole time. He even let me take a picture with him to announce our big surprise on Facebook. The drive home was fine, but it wasn’t until we got home that we had a little trouble with him. We took him out on the leash to see if he needed to go to the bathroom, but he completely freaked out. Probably because he’s never been outside or really been on a leash before. I had to catch him to calm him down. Once we took him inside he was a little better, but still very scared. When I placed him on the couch next to me he was much calmer and fell asleep. Since then, he’s been progressing. We’ve had our bumps with Rusty, but overall he’s coming around to be quite a playful and happy puppy. He’s now 3 months old and lively. He’s still a little scared with some things, but he’s a great addition to our family. He even loves cats! Overall, the hard work of keeping up with him, making sure he’s healthy, and behaving, all comes down to how much we love him. We were definitely lucky with our little miracle. Hopefully, you can find yours! 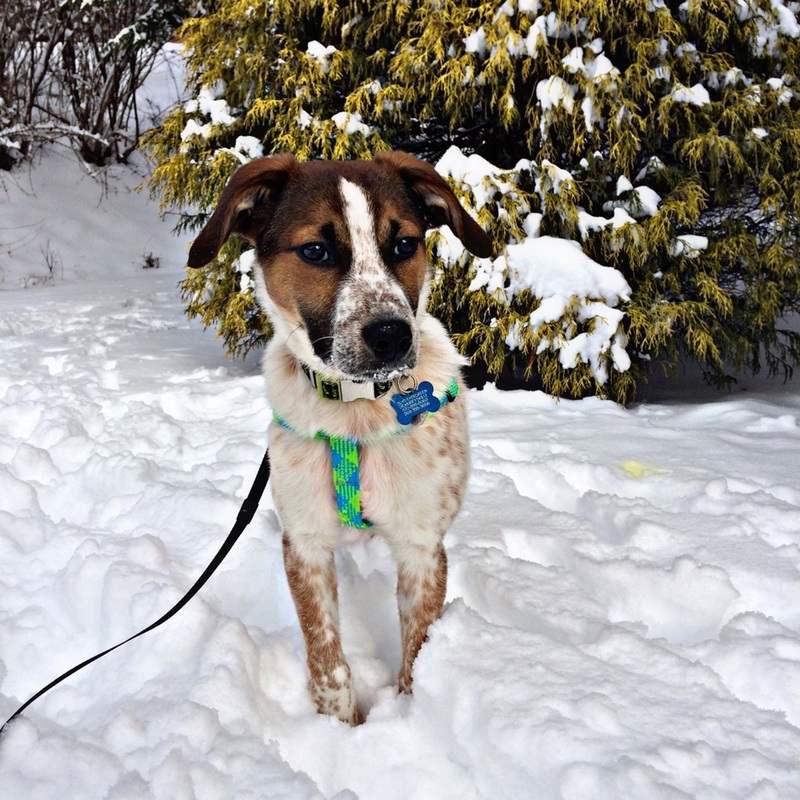 Enjoy some photos I took of Rusty on his first snow day! Also, enjoy the only picture I could get of our two other family members, Dakota and Spirit! It took two hours to capture for our Christmas card, but they sure do take a great picture!